For over a week now we've been hearing about a possible introduction of separate, customized themes with Samsung's skinned TouchWiz Android. So what do we have today? Well, it's yet another seeming confirmation that Samsung is, indeed, serious about offering its customers even more customization than it already does. 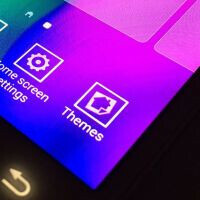 We now get to see how the Themes option figures into the homescreen-editing menu and within the Settings, and, of course, a quick peek at what will likely be the five built-in choices – Samsung Basic, Natural, Craft, Classic, and Sweet. Now, Samsung offering themes with TouchWiz is quite interesting, seeing as these are something of a specialty with Chinese OEMs – the same folks that Samsung is intent on competing with in their own backyard. Whether the South Korean electronics giant will be offering even more choices than those five – perhaps with a dedicated section within its app store – remains unclear. Considering the rapidly increasing number of seemingly-independent leaks pointing towards the same, it's probably about time we did away with skepticism and agreed that themes are coming to TouchWiz, and sooner than we initially thought. If they let the dev. make custom themes it will be even cooler. Also, it will be interesting to see if the themes actually affect the whole UI i.e. including notification and settings menu. Looks like more bloat to me. What Samsung needs is a huge overhaul of TouchWiz not more clutter. You do realize, if you don't like TouchWiz you can install an alternative launcher. Right? TouchWiz is more than just a skin. It si a application layer that adds significant capabilities to Samsung phones that no other Android phone or tablet has. PERIOD. Which is why Samsung sold 350M smartphones last year with most running TW. I have gone onto ATT, T-Mobile and Verizon's websites for people who have purchased Samsung Galaxy line of devices. I rarely see anyone complain about problems with TW. In fact most of the reviews are all positive. Most are talking about how great the features are. The vast majority have no idea what TW is or what it does. Does TW need an overhaul? NO! What it does need is to be able to run directly on the hardware. The reason for some lag is the fact Android is a Virtual Machine that doesn't have direct access to the hardware. If Android worked like C+ which is what iOS uses, the phones would run so much better. VM is the way to go. Even Apple is adopting it with swift. VM is to future proof the software so that it not directly dependent on hardware architect. launchers with themes is nothing new, i ditched all manufactures launchers long time ago, they are too much behind compared to fully advanced launchers in android app market. This about the whole interface, not just the launcher. Get a clue. I have mixed feelings over this. While this is something new (at least from big OEMs), I highly doubt this will help in improving TouchWiz' optimization. Samsung really needs to master first the efficiency of their skin before stuffing something that'll seem to bloat it even more. Instead of adding more bloat how about being dedicated to making their phones free of junk right out of the box. The amount of unremovable junkware in a Samsung phone is rather amazing. Palladium. Most of the time we don't see eye to eye but samsung do like to pre install unremovable apps taking up a lot of space. Most of these third parties will never be useful so they just take up storage and memory. Samsung need to be considerate and provide links for user to install out of their free will. Don't get me wrong bro, in fact I think Samsung makes one of the best handsets around (you can check my phones list). However it is not unknown to many that TouchWiz is (one of) the heaviest skin out there and the occasional hiccups has always been associated with it. I currently use Galaxy S5 and I still get slowdowns especially in the stock browser. I am so tired of reading (overblown) S lag comments and I hope Samsung is, too. So! iOS is finally getting things Android has for years. Do you yawn at that too?